Five-time gold medalist , Ryan Lochte, was literally swept off his feet, after a run in with an excited teenage fan. As a result, he has been forced to stop training after suffering a serious knee injury, courtesy of an overzealous female fan, who literally ran over the Olympic gold medalist, causing him to lose his balance. 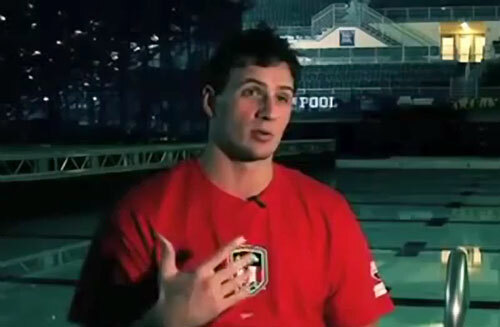 Photo shows Olympic gold medalist, Ryan Lochte, speaking in an earlier interview. Ryan Lochte is an eleven-time Olympic medalist (five gold, three silver, three bronze). His seven individual Olympic medals rank as second all-time in men’s swimming. If you would like to book athletes like Ryan Lochte for an event, contact Sports Speakers 360’s booking agent for appearance & speaker fees or call 1.855.303.5450.